Hematopoietic stem cells (abbreviated as HSCs), are multipotent stem cells that can develop into all the blood cells found in the bone marrow tissue and the lymphatic system. Sometimes they are also referred to as haematopoietic stem cells. Researchers have been studying and experimenting on HSCs for more than fifty years and they are probably the best understood type of stem cell. It was during the decade of 1940 that researchers first suspected the existence of cells that form other blood cells. Their suspicion derived from studies on people that were exposed to lethal radiation doses during 1945. In the early 50s scientists discovered that bone marrow transplants could save the life of radiated mice. The cells discovered by Till and McCulloch later became known as Hematopoietic Stem Cells. They have the capacity to undergo programmed cell death, a process known as "apoptosis" and/or "cell suicide"
Their role is to renew our blood by producing billions of new blood cells each and every day. 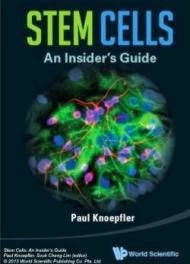 Which cells are derived from Hematopoietic Stem Cells? HSCs have a morphology that is very similar to Lymphocytes, the cells of the lymphatic system. They are rounded, non adherent and have a low cytoplasm-to-nucleus ratio. Their nuclei is rounded as well. 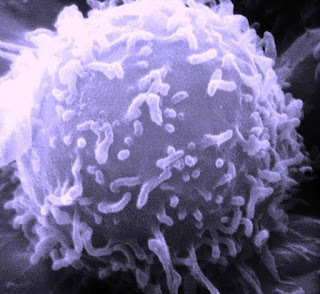 Electron microscope image of a human lymphocyte. HSCs look pretty much the same. HSCs can be extracted from many places from our body. One commonly used "extraction site" is the bone marrow of the iliac crest, located at the pelvis. The extraction process is quite simple. First the patient is put under anaesthesia. Then the doctor uses a special syringe to puncture the bone and draw out the bone marrow. 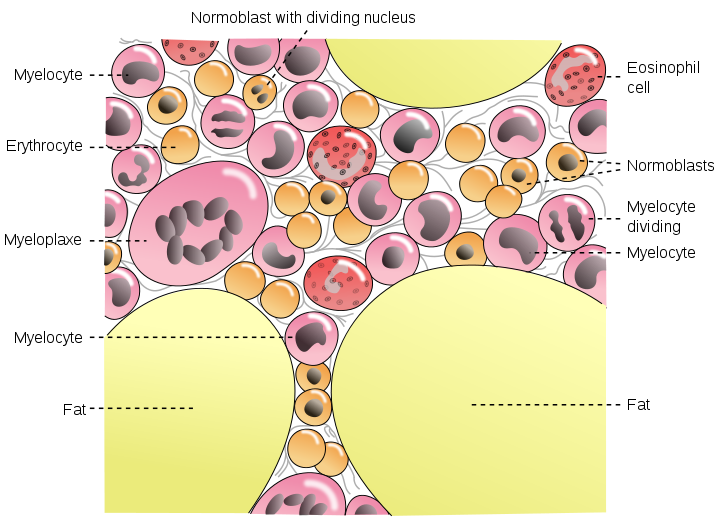 It is estimated that one in every 100.000 cells contained in the bone marrow is a HSC. 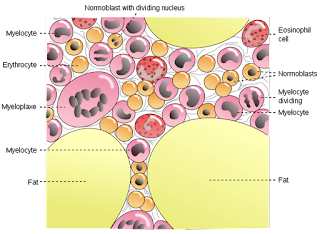 The rest are stromal cells, blood progenitor cells, red blood cells and others. 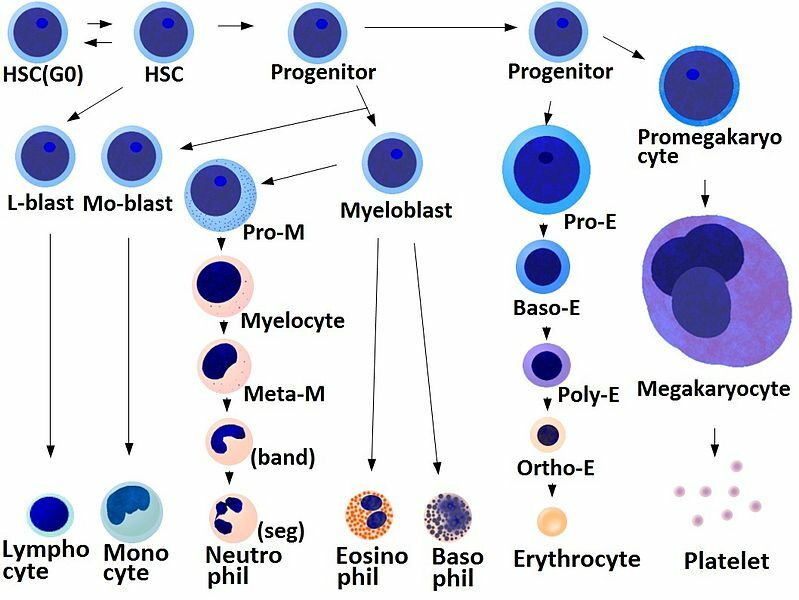 Another source of HSCs is peripheral blood, and has recently become the standard extraction source of HSCs, intended both for allogenic and autologous hematopoietic stem cell transplantation. Normally, the amount of HSCs in the peripheral blood is extremely low. But recently, researchers found that injection of cytokines (small cell-signalling protein molecules) induced HSCs to migrate from bone marrow into the peripheral blood. The most commonly used cytokine is GCSF (granulocyte colony-stimulating factors) which is injected a few days prior to the cell harvest. The cells are then collected with the help of an intravenous tube that is inserted to the vein of the donor. Through that tube the blood is passed through a filtering system that pulls out cells with the CD34 marker. CD34 is a protein found in the surface of various lymphatic cells and HSCs as well. The rest of the cells are returned back to the donor's circulatory system. Of the cells collected, only a 5 to 20 % is HSCs. The rest are progenitor cells and white blood cells. The pain is minimal and no anaesthesia is required. HSC transplantation from peripheral blood has a higher survival ration to standard bone marrow transplants. Patients also recover faster. The HSCs harvested from peripheral blood are almost double then the harvested cells from a bone marrow. During the 1980s and especially in the 1990s, it started to become clear that blood from umbilical cords and placentas is a very good candidate for extracting HSCs. These tissues have no other use and are typically discarded, so getting surplus amounts of cords and placentas is fairly simple. Unfortunately, the amount of HSCs that can be obtained from an umbilical cord is very small. For this reason HSCs from umbilical cords are more suitable for small children than adults. However recent advances have allowed the use of umbilical cord blood, taken from two umbilical cords allowing a "combined" HSCs transplantation to adults. In many clinics the mother can opt to have the cord blood, after the birth, harvested and stored for future use, for example to be donated to an ill sibling requiring a HSCs transplant. Finally, another source of HSCs are the blood-producing tissues of fetal animals. These cells are of great importance in research but have zero clinical applications. HSCs were first used for treating patients with various types of leukemia or lymphoma (blood cancers). Both of them are the result of uncontrolled white blood cell proliferation. During the very first applications, the patient’s own HSCs were first destroyed and then replaced with HSCs from a donored bone marrow transplant. As mentioned before, doctors prefer nowadays the use of HSCs taken from the peripheral blood. Allogeneic bone marrow transplants are also used for treating various blood disorders, including various types of anaemia and inborn errors of metabolism (large class of genetic diseases involving disorders of metabolism). One of the common side effects of chemotherapy and/or radiation is that they destroy the patient’s hematopoietic stem cell population and as a result their immune system is destroyed. Many of these patients receive an autologous hematopoietic stem cell transplant which restores their immune system back to normal. These autologous transplants are created from HSCs gathered from peripheral blood prior to the chemotherapy/radiation treatment. The main benefit of Autologous HSCs transplants is that patients don’t need anti-rejection drugs as the cells come from their own body. On the other hand, autologous HSCs transplants have the disadvantage that there is a high chance that cancer cells are also collected and reinfused back to the patient (along with the HSCs) leading once again to cancer development. All these conditions are similar in that the patient’s immune system attacks and destroys healthy cells and tissues that normally shouldn’t be destroyed. Researchers are trying to find ways to make the immune system function properly either via HSC transplantation or other means.